The issue of veterans benefits comes up a lot in a military divorce, as well as in estate planning. These benefits are paid to veterans with disabilities that occurred during active service or were aggravated by active service. They are paid monthly. I have assisted veterans whose benefits applications were denied. I have also represented military spouses in divorce and have needed to look into the disabled military spouse’s benefits and benefit applications in order to ensure my client’s rights were protected. The military spouse may have benefits that are not taxed but need to be counted toward income for child support and maintenance purposes. Sometimes, a veteran may claim he or she is disabled and cannot work or contribute financially when in fact the Department of Veterans Affairs concluded otherwise. This needs to be investigated. On the other hand, it is not the end of the story and the disabled veteran may have appeals or other ways to contest the determination. The bottom line is that this area of the law is complicated and difficult to negotiate without knowledgeable assistance. If you are a veteran, are a spouse of a veteran, have a child with a veteran, or are doing estate planning for a veteran, the following are unique components to these benefits that you need to take note of. Disability Math: The Veterans Affairs (VA) calculates the percentage of disability. Multiple disabilities are combined and separately rated. However, disabilities are not simply totaled. They are reduced progressively based on the total. There is also a “Special Monthly Compensation” which is a higher rate of compensation for veterans with special circumstances such as the loss of an organ, loss of an appendage and/or need for home care. There is also the Total Disability Individual Unemployability (TDIU or IU), which can be awarded to individuals who cannot find employment due to their disabilities. 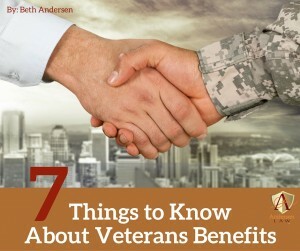 Even veterans who do not otherwise qualify for veterans’ benefits may qualify to TDIU. Unlike in the case of other disability benefits, the age of the veteran CANNOT be considered in determining whether to award veterans’ benefits. Dependents and Survivors: Veterans with dependents receive an additional monthly allowance as calculated in this table. There is also a Dependency and Indemnity Compensation (DIC) benefit available to survivors of veterans who died from their disabilities. The spouse must have been married to the veteran for at least one year in order to qualify for this benefit. Common law marriages can be recognized as marriage in Colorado, so a wedding ceremony and marriage certificate may not be necessary in order to qualify. A spouse of one year or more may also qualify for a Survivor Pension. Offsets: Military retirement pay offsets veterans’ benefits but Social Security benefits do not. Taxes: VA disability income is not taxed. Pension and Survivor Pension: Veterans who served during a period of war are entitled to this benefit. They must have been discharged under other than dishonorable circumstances. They also must be one of the following: over 65, totally and permanently disabled, receiving skilled nursing care in a nursing home, or receiving SSDI or SSI. Other Benefits: Veterans can also receive adapted housing grants, Service-Disabled Veterans Insurance, Veterans Mortgage Life Insurance and a burial allowance. Unique Exposures Based on Service: There are special coverages for certain veterans. For example, Vietnam veterans may have been exposed to Agent Orange, including Vietnam veterans who served in Thailand, Korean Veterans who served at or near the de-militarized zone, Blue Water Navy Veterans and veterans who served at Camp Lejeune. Find this list overwhelming? This is one of many reasons that you need to consult a lawyer in order to know your rights. Call Andersen Law PC at 720-922-3880 or email me at beth@andersenlawpc.com to learn more.